This figure shows a sample IPTV system. 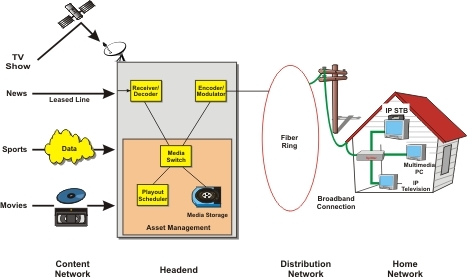 This diagram shows the IPTV system gathers content from a variety of sources including network feeds, stored media, communication links and live studio sources. The headend converts the media sources into a form that can be managed and distributed. The asset management system stores, moves and sends out (playout) the media at scheduled times. The distribution system simultaneously transfers multiple channels to users who are connected to the IPTV system. Users view IPTV programming on analog televisions that converted by adapter box (IP set top box), on multimedia computers or on IP televisions (data only televisions). This figure shows a functional block diagram of an IP STB. This diagram shows that an IP STB typically receives IP packets that are encapsulated in Ethernet packets. The IP STB extracts the IP packets to obtain the transport stream (TS). The channel decoder detects and corrects errors and provides the transport stream to the descrambler assembly. The descrambler assembly receives key information from either a smart card or from an external conditional access system (e.g. via a return channel). Using the key(s), the STB can decode the transport stream and the program selector can extract the specific program stream that the user has selected. The IP STB then demultiplexes the transport stream to obtain the program information. The program table allows the IP STB to know which streams are for video, audio and other media for that program. 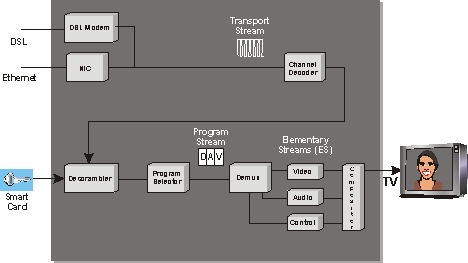 The program stream is then divided into its elementary streams (voice, audio and control) which is supplied to a compositor that create the video signal that the television can display. This figure shows how video can be sent via an IP transmission system. This diagram shows that an IP video system digitizes and reformats the original video, codes and/or compresses the data, adds IP address information to each packet, transfers the packets through a packet data network, recombines the packets and extracts the digitized video, decodes the data and converts the digital video back into its original video form. -World Wide Web consortium (W3C). Mr. Lawrence Harte has over 29 years of experience in the electronics industry including company leadership, product management, development, marketing, design, and testing of telecommunications (cellular), radar, and microwave systems. He has been issued patents relating to cellular technology. He has authored over 75 articles on related subjects and has been a speaker and panel moderator at industry trade events. Mr. Harte earned executive MBA at Wake Forest University and received his Bachelors degree from University of the State of New York. During the TDMA digital cellular standard development process, Mr. Harte served as an editor and voting company representative for the Telecommunications Industries Association (TIA) TR45.3, digital cellular standards committee. As of 2008, Mr. Harte had authored and co-authored over 100 books relating to telecommunications technology. He has served as a consultant and expert witness for leading companies including Ericsson, Siemens, VLSI, AMD, Casio, Samsung, Sony, ATT, Nokia, Hughes and many others.